Jared Unzipped: Happy Birthday Oscar the Grouch! Growing up as an introverted, grumpy kid, I could always relate to Oscar and his foul attitude. He didn't like it when other people told him what to do, or bothered him with questions when he didn't feel like talking. Yet, deep down, he was just as caring and compassionate as the rest of the residents on Sesame Street. His heart is just buried under a heap of stinking garbage. Oscar's birthday was revealed over fifteen years ago. On episode 3866, which aired January 24, 2000, the Sesame Street community celebrated Oscar's birthday -- much to his chagrin, of course. 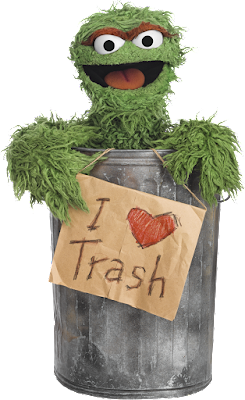 In reality, Oscar the Grouch made his first television appearance on November 10, 1969. Believe it or not, he wasn't always green! 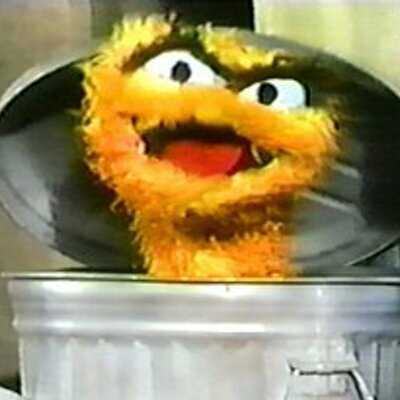 During the first season of Sesame Street, Oscar was a dingy orange hue. To explain the shift in color, the writers of the program had Oscar visit the Swamp Mushy Muddy, thereby permanently making him a gross green color. Oscar before he turned green. Here's to you Oscar. Keep on being grouchy!